After a few weeks of work travel, I have been itching to get up to the cottage (testing out the name – thoughts?) and was able to sneak away for a week to finally dive into getting the place up and running. My week was filled with trips to Home Depot where I quickly made friends with my man Mario. With his help, I was able to tackle replacing the shower head (it’s all about having a good wrench.) This was a short-term fix, as the bathroom needs an overhaul and that is nowhere in the near future, but it got the job done and now the water actually hits me instead of the wall. I will admit I was quite happy with this little accomplishment. Next on the list, was showing the windows a little love. I hadn’t realized that they were double pane, so my quick window washing chore turned into a two-day task. I did use the garden hose with the outdoor window cleaning product attached, but in the end my biggest lifesaver was the Microfiber Combi-Squeegee Scrubber, once I picked this up after torturing myself on day one my cleaning time was cut in half and the windows were crystal clear. The last couple of days I saved to dive onto my first real house project. Painting the kitchen. I will let these photos speak for themselves, but man what a difference a coat of paint can make. Removed the hardware and sanded the holes (front and back) smooth. Filled all holes and imperfections with wood fillers via a putty knife. Gave each cabinet a good scrub down with coarse sandpaper. Coat 3: using fine sandpaper, give the exterior a quick scrub to even out any bumps. then apply the last coat. 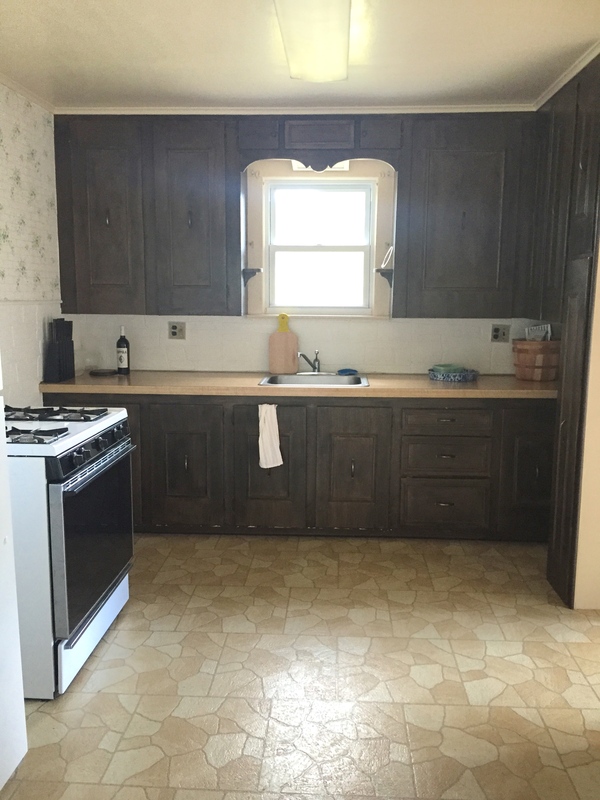 I did the first interior coat with a brush, but wanted more coverage given the cabinets were painted a very dark brown. I switched to a roller and then on after the last coat, I went over it with a brush (lightly) to give it a little texture. In the end, I am thrilled with how they turned out and can’t wait to move on to the next step – installing new hardware. 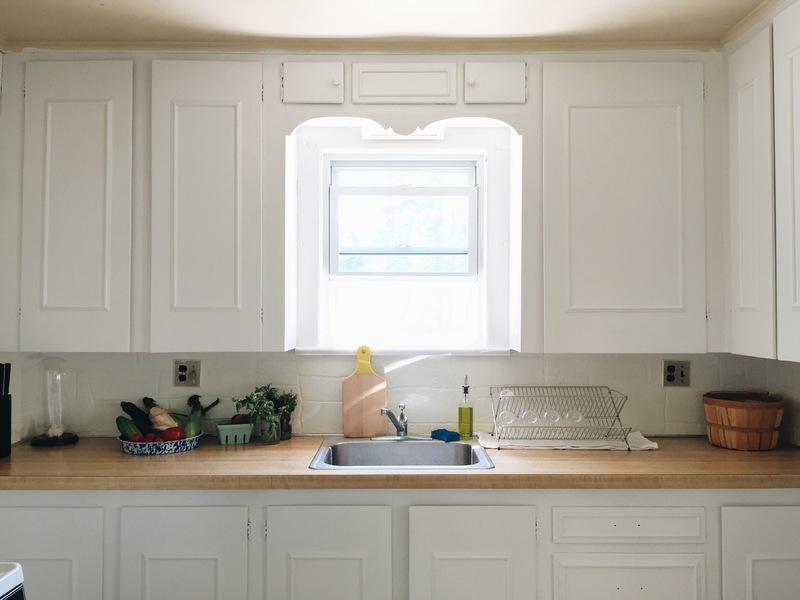 There are plenty of updates to come to the kitchen, but this first one makes it a whole lot easier to look at for the time being. 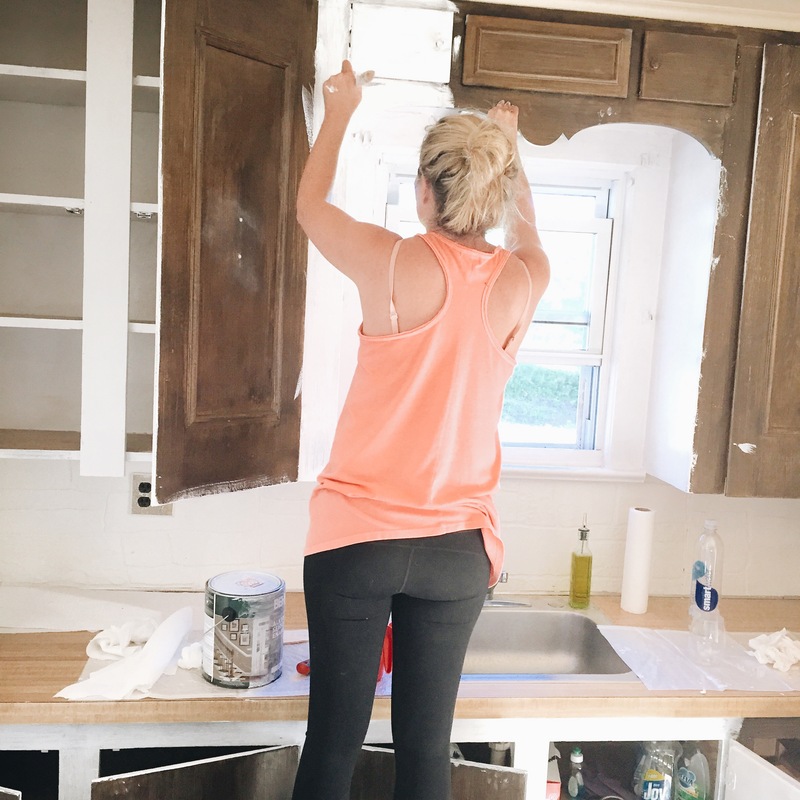 Between house projects, a couple of trips to the farmers market, and even entertaining my first guests – it was a packed week, but the cottage is official on its way!